Hmm...Taffy in your hair? It sounds odd, right? Just go ahead and discard the notion that this product is like melted Taffy candy in your hair! Surface's Taffy Whip is a unique styling product! Oh, and the scent...it is amazing!!! Taffy Whip texturizes hair and rubberizes spring into curls with natural mushroom, corn and sugar fibers. 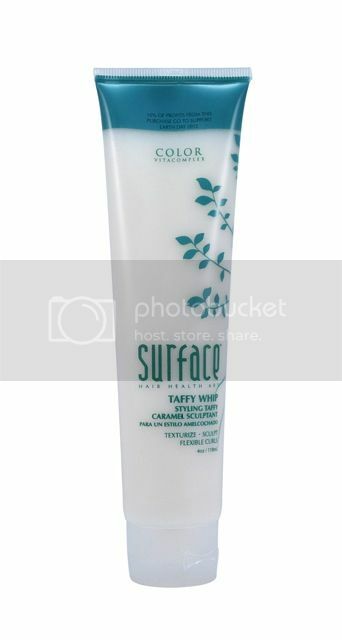 Taffy Whip is an ideal sculptant for all types of hair whether short or long, curly or straight, wet or dry! This phthalate free product gets it’s sweet scent from a proprietary blend of lavender and vanilla bean. Taffy Whip boasts a 100% humidity proof formula, guaranteeing impeccable style and hold. The first thing that I noticed about this product was the amazing scent!!! It is a super-sweet candy (fruity?) scent that just makes me want to eat the product (LOL, I promise that I refrain from *actually* eating the product). I can't totally place the scent. But, it reminds me of something! Surface states (see above) that the scent is from lavender and vanilla bean. But, honestly, I am not smelling the lavender. Either way, it smells amazing. The scent is strong and lasting too. When this product is out on the counter in the bathroom, literally the whole bathroom smells like Taffy Whip! SURFACE IS AS GREEN AS IT GETS! -All products are offered in recyclable packaging. The Taffy Whip is a sticky and creamy lotion. When you squeeze it out it is literally stringy and sticky like "real" taffy. But don't let the stickiness scare you! After you work it into your hair, it isn't "sticky" anymore. It just makes your hair feel more "dense" (if that makes sense). See my picture in the right hand side-bar! My hair is straight and very long. It has some long layers. But, the layers aren't that noticeable. Wet: This product can be used either wet or dry. I use it both ways. When my hair is wet (but towel dried), I apply a small amount (like 2 pea sizes) to my hands. I rub my hands together to warm up the Taffy Whip to help it spread easier. Then I work my hands through the lengths of my hair to distribute (focusing on the ends). I apply this product last in my hair routine (after leave-in conditioner and serum). Then I style my hair as usual. Dry: When I am finished with styling my hair, I add just a touch of product (like half a pea size) to the ends only. This gives fabulous piece-y texture to my hair. Love this final step! I really like using Taffy Whip! Not only does it help my style hold better, but also it makes my hair smell amazing! I find that the Taffy Whip really does help any "bend" last longer (from round brushing). My hair is so long and straight that it needs all the help it can get with holding style. Also, I love that it gives my hair some body and texture too. I feel that you can "see" my layers better from the definition that this product gives. Surface states that this product can be used for any hair type: long or short and even his or hers! Next up, I am going to see how my husband likes this! He has curly short hair. I am thinking this product might be a winner for his hair! Surface is an extensive professional hair care line made with organic, eco-friendly ingredients. Products are infused with organic botanicals, moisturizing antioxidants, and strengthening vitamins. Surface proves that superior hair care can be achieved through natural ingredients, including Surface multi-use hairsprays, which contain sugars and cornstarches that provide resilient humidity-resistant hold, and are anti-frizz and anti-static.